Serve with your favorite green salad and fresh rolls. In a soup pot, melt butter over medium-high heat. Add mushrooms and onion, cook and stir, until liquid evaporates, about 15-20 minutes. Add flour, dry seasonings, Mushroom and Chicken Bases, stir until well combined. Add water, bring to boil, reduce heat to medium-low and simmer uncovered for 15-20 minutes, stirring occasionally. 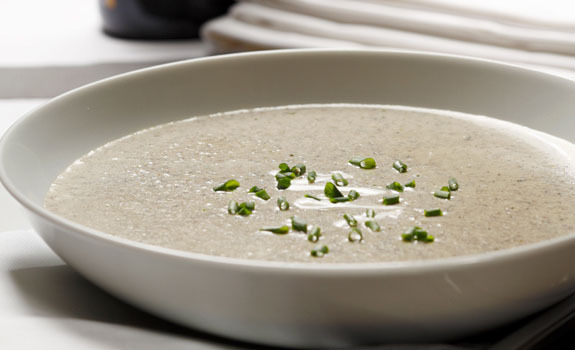 Remove soup from heat and puree soup with a hand held immersion or an electric blender. If using an electric blender process in batches, cover blender container and blend until smooth. Pour blended soup into soup pot, heat over medium-low heat. Slowly stir in cream. Cook and stir, until done, about 5-8 minutes.